Elizabeth Brass Elson remembers standing on the picket line when she was just seventeen-years-old. Her mother, once a member of the Canadian Armed Forces, was with a group of women trying to form a union. Elson says her mother taught her to make a stand in times of need. Today, she is doing just that. Originally from the Beausoleil First Nation in Ontario’s Simcoe County, Elson is now living at Springwater Provincial Park. She and a small group having been occupying the park – approximately 10 kilometres from Barrie, Ontario – since early April 2013. The small group is made up of people from other Indigenous nations. They’re based in a part of the park they call ‘Camp Nibi,’ meaning “uncompromised water” in the Ojibwe language. 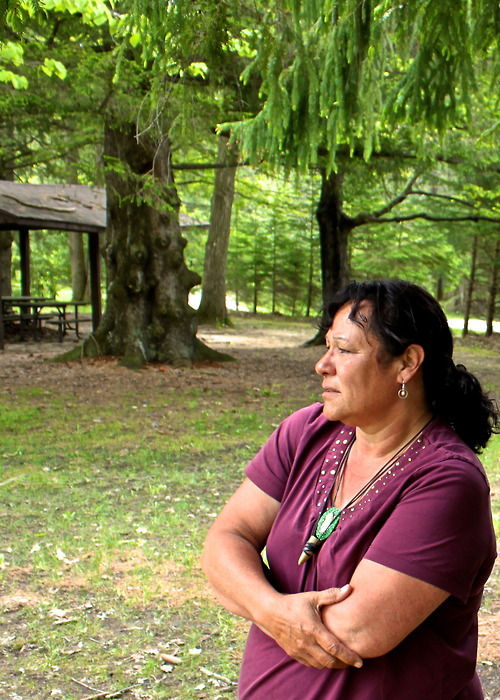 “We plan on keeping our lodge here forever, we don’t plan on going anywhere soon,” she says. According to Elson, the area was historically used by Indigenous peoples. She says she is exercising her right based on Article 26 of the United Nations Declaration of Indigenous Peoples; having the right to lands and resources that were once traditionally occupied. Known as an environmental champion, Elson was also behind the protest against Mega Quarry and Dump Site 41 – the creation of a rock quarry and a landfill in Ontario. Despite heavy pressure for the projects to go through, both projects were ultimately stopped. As an Anishinabe woman, Elson says it is her duty to protect the water from harm. 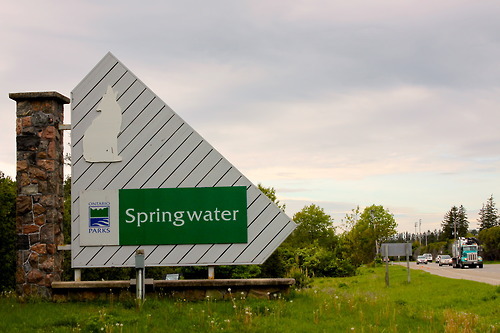 Made up of 193 hectares, including12 kilometres of trails, Springwater Provincial Park is a major headwater to the internationally recognized Minesing Wetland, and has been regarded as a place of ecological importance since the 1930s. But on March 31st, Ontario Parks took down its flag and changed the park’s status to non-operational due to low visitation and funding. To run the park annually it costs $60,000. With a gated entrance, visitors may still access the park but washrooms, running water and grass maintenance will no longer be provided. It is part of the province’s plan to pull itself out of debt. 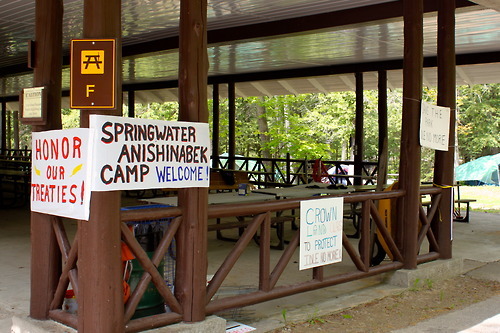 Springwater, along with six other parks have been shut down and since then groups like Camp Nibi, both native and non-native have taken an active interest in the park. Don Morgan, chair of AWARE Simcoe, an environmental group worries the park will get sold to an offshore developer. But Ken Lacroix, program manager with Ontario Parks says the province is only interested in business proposals from potential partners to open the park for 2014 operating season. “What they’re doing is divide and conquer basically,” says Morgan about the government’s approach. Les Stewart, long-time resident of Simcoe county and supporter of Camp Nibi is also concerned. “They’re cherry-picking who they have meetings with and that doesn’t indicate good faith,” says Stewart. So far the Ministry has not received a viable business proposal from anyone to give due consideration, says Lacroix. Ian Johnson, chief negotiator for the Chippewa Tri-Council, an alliance of three First Nation communities in southern Ontario, understands the province may have economic concerns but still feels this is the wrong approach. “Not everything in life, in particular parks or protected areas should come down to economics. There’s some higher social, cultural benefit to a park than simply a business model,” says Johnson. According to Johnson, if lands are being used by the crown for a purpose such as a park and ceases to use those lands for that public interest, then there’s an argument that Indigenous interests should advance. “At a minimum it calls for a dialogue,” says Johnson with those who take an interest in the park. Even though Elson is from Beausoleil First Nation, she is acting separately from the community. By occupying the park, Camp Nibi is showing their interest. “We do have some things on the table and its just a matter of time before we can let them out,” says Elson. It is the group’s goal to see Springwater as an educational and spiritual centre. So far, they’ve held full moon and drumming ceremonies, children’s programming and feasts. Elson is hoping other First Nations will follow her footsteps. “I wish that they all do this somewhere wherever there’s a park and it’s First Nation land,” she says. Hayden King, assistant professor in the department of politics and public administration department at Ryerson University says Elson’s actions represent a broader trend of First Nations reclaiming provincial parks. Parts of Awenda Provincial Park was reclaimed by two First Nations a few years ago, and Nishnawbe Aski Nation people have been violating park regulations to fish and hunt, says Hayden. Camp Ipperwash, an area once used for military purposes by the federal government during World War II was eventually transferred back to the people of Kettle and Stony Point First Nation. But it didn’t happen without a bitter war between both governments and First Nation, and the death of Dudley George from Stony Point First Nation, who was shot and killed by an OPP officer. “The difference between Camp Nibi and all these other examples has been the lack of violence and lack of prosecutions,” says Hayden. Determined and refusing to leave the park, Elson has no intention of letting things get out of hand. “This will be her third victory, Dump Site 41 and Mega Quarry and now Springwater Park,” says Les Stewart about Elson. Elson is now in her 7 month of occupying the park. Slowly with temperatures dropping she is enjoying her stay. “This land is very spiritual, it grabs you when you come here,” says Elson.